Listed below are some of the key enhancements that have been added to axis vMerchant. 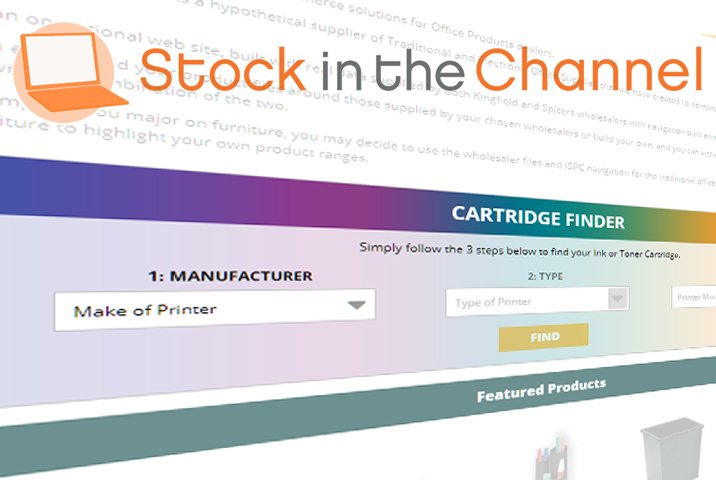 Support for enriched product data from Stock In The Channel has been extended to include their printer compatibility data, offering a further choice to those who wish to include a Cartridge Finder tool on their axis vMerchant website and/or via their back-office axis diplomat system. A recent development for axis diplomat 2018 customers with Software Assurance means that you can ensure that the stock levels reported on your axis vMerchant website will always show at least a certain number in stock. This is controlled on a product group-by-product group basis. This is ideal for products that you can always make or source on demand. This new option allows you to send reminder emails to your customers if they abandon their shopping basket before completing the checkout process. Provided that they have logged in, or have proceded beyond the point in the checkout where they have provided their email address, the website can then send them an email, containing a link that will allow them to resume their checkout process. You are able to configure the content of the email by providing a suitable Content Management System (CMS) entry. You are also able to choose the time interval between the checkout being abandoned and the reminder email being sent. The function to publish data to your axis vMerchant website has been re-worked to improve the efficiency of uploading eBusiness Vouchers. This will have a significant impact on the time taken to publish vouchers, particularly on systems with a large number of vouchers that are limited to specific eBusiness Groups. Giving users control over the ways in which you contact them is one of the underlying principles of the General Data Protection Regulation ("GDPR"). If you regularly market to your customers using a variety of methods (such as email, post and phone) axis diplomat now allows you to maintain, for each contact, which methods they are prepared to accept and their preferred option. If you produce a number of separate regular marketing newsletters, axis vMerchant now allows your customers to choose which newsletters they subscribe to. Giving users more control over the marketing communictions that they receive from you is one of the underlying principles of the General Data Protection Regulation (GDPR). Each type of newsletter should be configured as a campaign. Those campaigns are then marked as "Published". Your website can then offer users the option of opting in and out of each published campaign. These subscriptions are then synchronised back into your axis diplomat system as campaign memberships. The eBusiness Mailing Lists module, used in conjunction with axis vMerchant-based websites, now supports double opt-in. Using a double opt-in is considered best practice, especially in light of the General Data Protection Regulation (GDPR), as it helps ensure that the email addresses supplied via your Newsletter Sign-Up page are genuine and that those subscribing have definitely provided consent. With double opt-in, anyone supplying their email address to your newsletter subscription page is sent an email with a confirmation link. Only when they click that link are they actually added to your mailing list. Configuration is very simple - just tick the box on the Mailing List tab of Maintain Sites and supply a CMS entry to hold the body of the confirmation email. For those with bespoke websites, the only website change required is to create the confirmation page - for those with template-based websites, this page is already in place. Canonical Tags are a benefit in Search Engine Optimisation since they tell the search engine what the true address of the web page should be and so prevent the appearance of duplicate content. This can otherwise occur when, for example, a stock item or eBusiness Group's description is changed and the previous address is held within the search engine's index. After extensive research into the current leading trends for providing a simple, pain-free checkout experience, we are pleased to launch a completely revised checkout. This checkout can be enabled on any template-based website and can be reverse-engineered into existing bespoke websites. All new bespoke websites built by axisfirst will now, unless otherwise requested, use this new checkout. A simple and straightforward process reduces lost orders due to abandoned checkouts and helps eliminate errors (such as incorrect delivery options). The user is asked to enter their email address - if they have previously created an account but have forgotten, they are able to continue without logging in. This features the same Order Summary block on the right-hand side as the Shopping Basket page and is always in view. The overall layout of the page has been improved to guide the user through the checkout process. This page allows the customer to specify their billing address and an optional different delivery address. Once an address has been specified, the delivery options that are valid for that address are displayed. This checkout has been incorporated into our EGPL demonstration website- please feel free to try it for yourself! axis vMerchant has been extended to support an additional payment type of BACS (or Bank Transfer). This is treated in the same way as the existing payment types of Cheque and Cash - in each case, the payment is imported as "Pending" and can be updated once the funds are received. We have now added greater flexibility to the stock availability messages displayed on axis vMerchant websites. You are now able to specify the messages displayed for no stock, low stock and out of stock and, in each case, the message can contain the current stock availability figure and/or the lead time. Using a development released as part of axis diplomat 2016, the lead time can be a fixed number across your entire site or derived from information on the particular stock item - the default delivery to customer field, the delivery lead time or a combination of the two. axis vMerchant has been extended to allow you to create website accounts for your own staff (typically those in Sales or Customer Services) which allow them to login to the website and then switch to any of the other accounts that they look after. The customers are identified within axis diplomat by order source code and the functionality is available to anyone using the axis diplomat Agents Commission module. For those with template-based websites. the functionality is automatically enabled as soon as the data is configured; for bespoke websites, the functionality can, in most cases, be added very easily. axis vMerchant has been extended to allow self-registration on B2B websites. Traditionally, due to the sensitive nature of special trade pricing and/or the ability to buy on account, access to a website for trade accounts needed to be first enabled for specific customers within the axis diplomat system. With recent developments to axis vMerchant, this can now change - trade customers can register for themselves by supplying their customer account reference and either an email address that matches an existing contact on that account or the correct postcode for that account. This means that you do not need to have current valid email addresses for all of your existing trade customers before they can start using your B2B website. To take advantage of this development, you will just need some minor design changes to your login and registration pages.